Más rud é nár ghlac tu páirt riamh cheanna i gCór Náisiúnta na nÓg, molaim go mór duit triail a bhaint as i mbliana i gcomhair 2019. If you’ve never taken part in the National Children’s Choir, I would really recommend getting involved for 2019. Gach uair, glacann os cionn 8,000 páiste páirt, ag foghlaim na namhrán, ag cleachtadh in a gcuid scoileanna féin, ag dul go cleachtaí réigiúnacha, ag réitiú le haghaidh ceolchoirmeacha réigiúnacha agus faigheann cuid de na páistí seans canadh sa Cheoláras Náisiúnta. // Each cycle, over 8,000 children take part, learning the repetoire, practicing in their own schools, having regional rehearsals with other schools, preparing for regional concerts, and some children get to sing in the National Concert Hall. Faigheann múinteoirí an ceol uilig atá de dhíth, chomh maith le dlúthdhioscaí a chabhríonn leis an gceol ar fad a mhúineadh. Déantar chomh héasca agus is féidir é. // Teachers receive all of the necessary music to teach the programme, as well as various teaching CDs which make taking part as easy as possible. Conas mar atá Cór Náisiúnta na nÓg difriúl ó chóranna eile ar nós Peace Proms nó an Hallelujah Choir? // What makes the National Children’s Choir different from initiaves such as Peace Proms or the Hallelujah Choir? Tá réimse i bhfad níos leithne ceoil á mhúineadh i gCór Náisiúnta na nÓg, idir amhráin traidisiúnta, amhráin clasaiceach, opera, popcheol, roc-cheol agus ceol nua-chumtha. Canann na páistí as Béarla agus as Gaeilge gach bliain agus uaireanta bíonn amhráin san Fhraincis, sa Ghearmáinis, san Eabhrais, sa Laidin agus i dteangacha eile. // The diversity in the music taught is much greater in the National Children’s Choir, to include traditional songs, classical songs, opera, pop music, rock music and newly-composed music. The children sing in both English and Irish every year and usually in many other languages too, to include, French, German, Latin, Hebrew and many others. Tá an cheol agus na hamhráin níos dúshlánaí, agus mar sin níos mó oideachasúil ná mar atá sna tionscadal eile a luaigh mé thuas. Cé go mbíonn i gcónaí amhrán nó dhó atá ‘in unison’ canann na páistí don chuid is mó i dhá pháirt, agus uaireanta trí pháirt. Foghlaimíonn na páistí tráthúlacht, rithim agus comhcheol trí pháirt a ghlacadh. // The music and songs are more challenging, and therefore more educational, than the repetoires in other programmes such as the ones I mentioned above. While there are always one or two songs ‘in unison’, the children sing predominantly in two parts, sometimes in three parts. The children learn about timing, rithim and harmony by doing this. Céard atá le déanamh chun páirt a ghlacadh? // How do you take part? Téigh go suíomh idirlín Chór Náisiúnta na nÓg chun do scoil a chomhcheangail. I ndiaidh sin a dhéanamh faigheann tú do phacáiste múinteoireachta agus faigheann tú amach na sonraí uilig maidir le cleachtaí is araile ag braith ar cén áit sa tír ina bhfuil tú. Caithfear comhcheangailt a dhéanamh roimh Aoine an 21ú Meán Fómhair seo!// Go to the National Children’s Choir website in order to affiliate your school. After affiliating you will recieve your teaching pack and you will also find out about the practices and other schools in your group, depending on where in the country you are located. Seo tús curtha le mo sheomra ranga don bhliain scoile nua seo. Is Rang 3 a bheidh agam. Ghlac mé an chéad ceithre phictiúr ó chúinní an tseomra. Here’s a start to my classroom for this new school year. I will have 3rd class. I took these first four pictures from each corner of the room. Seo conas mar a bhíonn rudaí á choinneál agam – rudaí a bhíonn in úsáid go laethiúil againn idir pinn agus pinn luaidhe, gliú, siosúir, marcóirí, criáin, is ar uile. Tá dhá thaobh leis an seilf seo (a tháinig ó Ikea) agus bíonn na cláracha bána beaga ar bharr agam. This is how I keep bits and pieces – things that we’ll use daily such as pens, pencils, glue, scissors, markers, crayons, etc. There are two sides to this shelf (which came from Ikea) and I keep the mini whiteboards on top. Ar leac fuinneoige amháin tá na trádairí ina mbíonn na cóipleabhair agus a bhíonn ag cabhrú liom smacht a choinneáil ar an bpróiséas cheartúcháin. Tá lipéidí orthu le cabhrú leis na páistí a bheith eagraithe agus a gcóipleabhair a chur ar ais san áit cheart. Ar an dara leac fuinneoga tá na boscaí a bhíonn in úsáid agam do na stáisiúin – chun na háiseanna a bhailiú do na grúpaí éagsúla. Ligeann siad dom réamh-eagrúchán a dhéanamh agus an glanadh suas a fhágáil go deireadh an lae nuair is gá. Tá na trádairí agus boscaí seo agam le cúpla bliain anuas ach tháinig siad uilig ó siopaí ar nós Mr. Price nó Dealz ag an am. On one window sill I have the trays I use to store copies and to track what needs to be corrected. These are marked with the subjects in order to help the children to be organised and to return copies to the right place. On the second window sill are the tubs that I use for station teaching – for gathering the required resources for each group. These allow me to prep in advance and to complete the tidy up process after school when required. I’ve had all of the trays and tubs for a few years now but they all came from shops such as Mr. Price or Dealz at the time. Seo cúinne na ngrúpaí. Is áit seo a bhíonn in úsáid agam chun grúpaí beaga a thabhairt chun cabhair breise a thabhairt dóibh fad is atá na páistí eile ag obair go neamhspleách – don chuid is mó ag am liteartha nó ag am mata. Tháinig an cairpéad, na binsí agus agus na cúisíní ó Ikea. Tá cláracha bána beaga agus cúplá áis eile istigh sna tarracáin beaga. This my group corner. It’s a space I use to take small groups aside and give them extra support while the other children are working independently – most often during literacy and maths. The rug, the benches and the pink cushions came from Ikea. There are mini whiteboards and some other useful resources in the little drawers. Seo mo chúinne leabhairlainne. Tháinig an cairpéad agus na cathaoireacha in Ikea (ag ceapadh b’fhéidir go bhfuil fadhb agam faoin am seo!!) agus tá an córas leabhairlainne féin déanta agamsa agus ar fáil go hiomlán dátheangach anseo. This is my library corner. The rug and the chairs came from Ikea (I’m thinking maybe I have a problem at this stage!!) and I created the printed library system myself. It’s fully bilingual and available here. Cúpla pictiúr de mo chuid cláracha bána. Ceann mór ar a bhfuil na soilse tráchta don measúnú agus áit chun an TAFF agus TAL a léiriú agus ceann don obair bhaile. Tagann na cártaí TAFF agus TAL i nGaeilge agus i mBéarla anseo. A couple of photos of my whiteboards. The big one has the traffic lights for assessments and a place to display the WALT and WILF. The smaller board is for homework. The WALT and WILF cards are available here both in Irish and English. Tá an t-ádh linn sa scoil go bhfuil sliderobes againn sna seomraí ranga agus iad iontach chun áiseanna a choinneáil eagraithe. Seo cúpla pictiúir de mo chuid áiseanna sa bhealach ina mbíonn siad stóráilte agam. An bhfuil sé soiléir go bhfuil mé tógtha le lipéid?? We’re lucky in my school to have sliderobe storage in our classrooms which are brilliant for keeping everything organised. Here’s a few pictures of my resources in the way that I store them. Can you tell I like labels?? Seo cuid de na rudaí atá ar na ballaí cheanna féin agam – rudaí nach dtiocfaidh anuas ar chor ar bith don bhliain. Is féidir teacht ar na réamhfhocail anseo, na ceisteanna comónta anseo, na seanfhocail anseo agus na quotes anseo. These are some of the things that I’ve already put up on the walls – things that won’t come down at all for the year. You can get the prepositions here, the common questions here, the seanfhocail here and the quotes here. Seo na dualgais ranga a bheidh ag na páistí. Athróidh siad gach seachtain. These are the classroom jobs that the children will have. They’ll change each week. Críochnóidh mé le cúpla pictiúr eile sa seomra : tarracáin chun páipéir a stóráil, samplaí de na cláracha balla réidh le dul, an bosca solais, stáisiún ríomhaireachta agus rud nó dhó eile. I’ll finish with a few other photos : drawers for storing paper, some of the display boards ready to go, my lightbox, the computer area and a couple of other bits and pieces. Tá súil agam go bhfuil smaoineamh nó dhó anseo a bheadh cabhradh daoibh. Go n-éirí libh uilig le tús na bliana nua! I hope there was something useful there to some of you. Wishing you all the best of luck with the new school year. Le meon an fháis, creideann daoine gur féidir leo a gcuid ábaltachtaí a fheabhsú agus a chur chun cinn trí dígreasacht agus obair dhian. Is é an creidiúnt seo a chuireann muid ag iarraidh foghlama agus a thugann athléimneacht dúinn a bhíonn de dhíth le bheith rathúíl tríd an saol, i bhfad taobh amuigh de bhallaí an seomra ranga. Ach is sa seomra ranga gur cheart don meon seo tosú. In a growth mindset people believe that their abilities can be developed and improved upon through dedication and hard work. This belief fosters a desire to learn and a personal resilience which is required for accomplishment and success right through life, far beyond the walls of the primary school classroom. But it is in the classroom that it should begin. Seo tábla a fuair mé ar líne a léiríonn an bealach difriúl ina mbíonn páiste ag smaoineamh faoin bhfoghlaim nuair atá meon an fháis curtha chun cinn acu. Creidim go bhfuil sé iontach tábhachtach go mbeadh dóthain muiníne ag gach páiste ar scoil bheith ag smaoineamh futhú féin agus faoina gcuid foghlaim sa bhealach seo. Seo bealaí chun an meon seo a chothú le do chuid daltaí i do sheomra ranga féin. This is a table that I found online that shows the different way a child thinks about learning when they have developed a growth mindset. I believe that it is extremely important that every child at school should have enough confidence to think about themselves and their learning in this way. Here are some ways to foster this mindset with your own students in your classroom. Déan cinnte go mbíonn iarracht níos tábhachtaí ná rud ar bith eile. Tabhair moladh, moladh agus níos mó moladh. Bí ag moldadh iarrachta ó thús deireadh an lae. Make sure that effort is more important than anything else. Give praise, praise and more praise. Be always praising effort every day, from beginning to end. Leantar ionchais atá ard (ach insroichte chomh maith) le sroicheadh, agus i ndiaidh sin le sásamh, bród agus lúcháir. Cruthaíonn sin spreagadh agus fonn foghlama. High (although attainable) expectations are followed by attainment, and then by satisfaction, pride and joy. This in turn creates motivation and a desire to learn more. Ionas gur féidir an meon seo a chothú, agus go mbeidh buntáistí saoil le fáil as, caithfidh dúshlán a bheith ann. Caithfidh gur féidir leis na páistí a bheith rathúíl agus a bheith bródúil as a gcuid oibre. For this mindset to take root, and to provide lifelong benefits, a challenge must be present. It must be possible for the children to achieve success and to feel pride in their work. 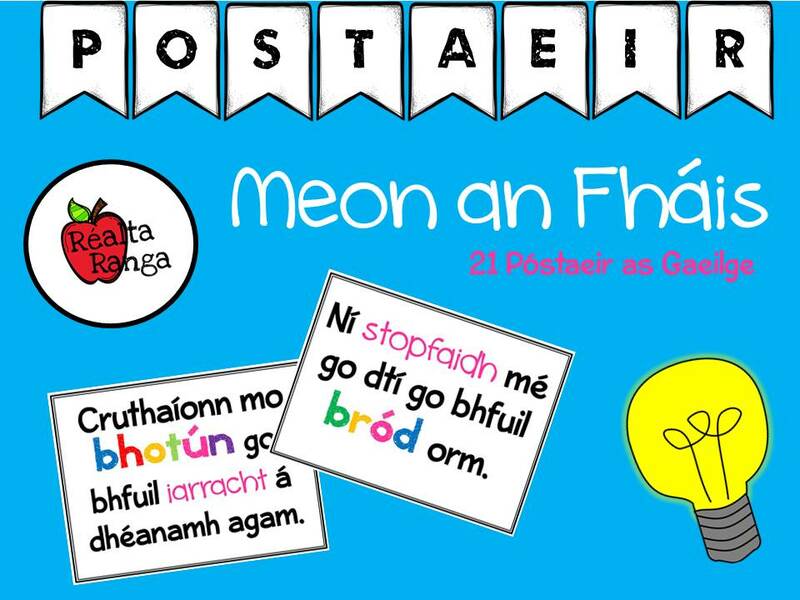 Tá sé thar a bheith tábhachtach go mbíonn páistí in ann éisteacht linn á gceartú agus go mbíonn siad in ann an dearfacht a fheiceáil agus a chloisteáil sa cheartúchán sin – go dtuigeann siad go dtarlaíonn an chuid is mó foghlama trí na botúin a dhéanann siad. It is so important that children are able to listen when we correct them and that they can see and hear the positivity in those corrections – that they understand that most of their learning comes from the mistakes that they make. Bíonn níos mó úinéireachta ag páistí ar an bpróiséas foghlama más rud é go mbíonn rogha acu (ar a laghad uaireanta) faoin rud atá siad ag foghlaim nó faoin mbealach atá siad á fhoghlaim. Ligeann don úinéireacht seo dúinn meon an fháis a chur chun cinn. The children have more ownership of the learning process if they have a choice (at least some of the time) about what they are learning or about how they are learning it. This ownership allows us to develop a growth mindset. Tiocfaidh an athrú meoin i bhfad níos éasca, agus i bhfad níos tapúla más rud é go dtuigeann na páistí nach é an freagra ceart an rud is tábhachtaí ar chor ar bith, ach go bfhuil an próiséas foghlama, na ceisteanna a chuireann siad agus an t-iarracht a dhéanann siad níos tábhachtaí. The change in mindset will come more easily and more quickly if the children understand that the right answer is not the most important factor at all, but that the learning process, the questions that they ask and the effort they put in are all far more important. Beidh seo ar fad á mhúineadh agam ag tús na bliana le mo rang agus á phlé agam leo. Ansin tiocfaidh muid ar ais ag na rudaí éagsúla go minic agus beidh na postaeir seo crochta agam sa seomra ranga ionas go mbeidh meabhrúchán acu go minic. Beidh cuid acu á chrochadh ar chúl an dorais sa leithreas chomh maith, ionas go bhfeicfidh na páistí rud éigean dearfach gach uair go mbíonn siad istigh ann agus go gcabhróidh sé leo ó thaobh féinmhuiníne de. Is féidir teacht ar na póstaeir anseo má tá suim agat iontu. I will be teaching all of this at the beginning of the year with my class and discussing it in depth with them. Then we will come back to the various elements of it often throughout the year. These posters will be hanging in the classroom so that the children always have a visible reminder. I will have some of the posters hanging on the back of the bathroom doors too so that the children get a positive reminder while they’re in there which will help to build self-confidence. The posters are available here if you are interested in them. Léitheoireacht Beirte chun páistí a spreagadh chun léitheoireachta as Gaeilge // Paired Reading as a way to encourage children to read in Irish. Cé go bhfuil an Ghaeilge ar a dtoil ag na páistí sna Gaelscoileanna, cloistear go minic go mbíonn sé deacair iad a spreagadh leabhair as Gaeilge a léamh. Roghníonn siad leabhair as Béarla i gcónaí. Is tríd an léitheoireacht beirte seo go gcuirim ag léamh as Gaeilge iad, agus ag baint sult as. Ní dúshlán chomh mór sin a bhíonn os a gcomhair agus iad ag léamh le pairtnéir atá ar an leibhéal léitheoireachta céanna leo. Tá sé tábhachtach gur léitheoireacht don phléisiúr atá i gceist leis agus mar sin ní bhíonn aon obair scríofa breise le déanamh acu bunaithe ar an léitheoireacht seo. Tugaim leabhair difriúla do na grúpaí ar fad ionas go mbeadh úinéireacht acu ar an léitheoireacht seo agus ionas go mbíonn sé éasca idirdhealú a dhéanamh, a chinntiú go bhfuil gach beirt ag léamh ar léibhéal atá cuí dóibh. Agus na leabhair á thabhairt amach agam, léim cúl gach leabhar os árd don rang ag cinntiú go gcuirim sceitimíní orthu faoin scéal – ag cinntiú go mbíonn siad ag iarraidh na leabhair a léamh. While the children in our Gaelscoileanna understand and speak Irish, it is often a struggle for us teachers to encourage them to choose to read in Irish. More often than not, when given the option, they will choose to read in English. It is through this process of paired reading that I get them reading for pleasure, through Irish, and enjoying it. The challenge in front of them doesn’t seem quite as daunting when they are reading with a friend or partner who is at a similar reading ability to themselves. It is important that this reading is for pleasure and so I don’t assign any extra written work based on these reading sessions. Each pair gets a different book, ensuring that they have ownership over this reading. This also ensures that it’s easy to ensure differentiation – that each pair are reading at a suitable level but without drawing attention to this. When assigning the books, I read the back of each book aloud, making them excited about the story – ensuring that they really want to read the book. Conas mar a oibríonn sé? // How does it work? Is próiseas fíor-shimplí seo. Suíonn beirt le chéile, leabhar amháin eatarthu agus iad ag breathnú isteach le chéile. Léann páiste A alt. Ansin bíonn ar pháiste B an chuid sin a mhíniú ina f(h)ocail féin. Léann páiste B an chéad alt eile agus míníonn páiste A an píosa sin. Cabhríonn siad lena chéile a chinntiú go bhfuil tuiscint acu ar an rud atá á léamh acu, agus iad a tabhairt faoi deara gur féidir tuiscint a bheith acu fiú muna dtuigeann gach uile focal. Bíonn foclóir ar an mbord acu ar eagla nach dtuigeann siad aon rud agus má bhíonn fadhb fiú tar éis foclóra a úsáid, cuireann said ceist orm. Chomh maith le sin, coinníonn siad a leabhair nótaí ar oscailt chun aon nathanna deasa a aimsíonn siad a bhreacadh síos. Bíonn an seomra ranga glórmhór go leor agus beomhar nuair atá an léitheoireacht seo faoi lán seoil. I mo thaithí, baineann na páistí an sult as seo agus bíonn siad ag súil leis. It’s a really simple process. Two children sit together, one book between them, looking in together. Child A reads a paragraph. Then Child B explains what happened in that paragraph in their own words. Child B reads the next paragraph and Child A explains it. They help each other to ensure they’re understanding what they’re reading, while realising that understanding can occur even if they don’t understand each and every word. They have a dictionary on the table in case they need it and if they are still stuck after trying the dictionary, they ask me. They also keep their notebooks open to make a note of any nice phrases that they come across. When these reading sessions are up and running they classroom will be noisy and lively. In my experience, the children really enjoy the sessions. They really look forward to them and are very rarely disengaged with the process. Seo cúpla taifeadadh gairid de pháistí i mo rang féin ag léamh agus ag míniú lena chéile. Tá sé deacair go leor iad a chloisteáil in áiteanna toisc go bhfuil na páistí eile ag léamh ag an am céanna. Tá súil agam gur féidir a bhraith ó na físeáin seo conas mar a oibríonn seisiún léitheoireachta beirte. Here are a couple of short recordings of children from my own class reading and showing understanding. It’s difficult to hear in spots because the other children in the class are reading at the same time. I hope these give a feeling for how a paired reading session feels. Cén leabhair a bhíonn á léamh acu? // What books do they read? Ní téacsanna scoile a bhíonn i gceist don chuid is mó, ach úrscéalta éagsúla do pháistí, cuid acu dúshlánach (do na léitheoirí láidre) agus cuid eile simplí go leor (dóibh siúd atá lag ag an léitheoireacht). Sna pictiúir seo, is na leabhair is dúshlánaí atá ar bharr agus na cinn is simplí atá ar bhun. Tá súil agam go gcabhróidh siad. For the most part, I don’t use school texts, but rather random children’s novels, some challenging (for the stronger readers) and others fairly simple (for those weaker readers). In these pictures, the books at the top are more difficult to read, decreasing in difficulty, the easier books at the bottom. I hope these suggestions will be helpful. Tá an dá leabhar seo an-dúshlánach agus oiriúnach má tá léitheoirí an-láidir sa rang agat. Tá an dá leabhar seo á léamh ag na léitheoirí is laige i mo rang. Mholfainn d’aon mhúinteoir seo a chur i bhfeidhim. Cé go bhfuil na leabhair thús roghnaithe do Rang 6, is féidir tabhairt faoin bpróiseas céanna in aon rang ag baint úsáide as leabhair oiriúnacha. I would advise any teacher to put this process in place. While the books in the list above have been selected for 6th class, the process can be followed in any classroom, using appropriate reading material. Is gníomhaíocht álainn seo le tabhairt faoi sa seomra ranga. Bhain na páistí fíor sult as fad is a bhí gnéithe de na curaclaim eolaíochta, stair agus tíreolas á chlúdú agat. Seo mar a rinneamar i Rang 6 é, ach d’fhéadfá é a dhéanamh in aon rang. D’úsáidfinn próca idir grúpa, b’fhéidir, leis na páistí óga ionas go mbeadh siad in ann an obair fisiciúil a roinnt. This a great activity to have a go at. The children really enjoyed it while covering elements of the science, history and geography curricula. Here’s the rundown on how we did it in 6th class, but this could be done with younger age groups. I might do one jar per group with the younger children so that they can share the physical work of shaking the jar without tiring their arms. Rudaí atá de dhíth : próca gloine le barr air do gach páiste (nó gach grúpa) – glanta agus an lipéid bainte de, uachtar (bhí thart timpeall ar 150ml an pháiste agam), gráinnín salainn do gach páiste agus arán le n-úsáid chun an t-im a bhlaiseadh ag deireadh. What you need : a glass jar with a lid per child (or per group) – cleaned out and the label removed, regular cream (I had approximately 150ml per child), a pinch of salt per child and some bread to taste the completed butter on. Cuireann siad an t-uachtar agus an salann sa phróca agus dúnann siad é – go cúramach. Ansin bíonn orthu an próca a chroitheadh chomh tapaidh agus chomh láidir is gur féidir leo go dtí go mbíon an t-im le feiceáil sa phróca leis an mbláthach timpeall air. Tógann sé idir 5 agus 15 nóiméad orthu ag braith ar láidreacht an pháiste. Chuir muidne ceol ar siúl agus seo á dhéanamh againn agus bhí gach éinne ag cur allais go tapaidh. They put the cream and the salt into the jar and close it – carefully. Then they just shake the jar as quickly and as strongly as they can until they can see the butter clumping with the buttermilk around it. It takes between 5 and 15 minutes, depending on the child’s strength. We put music on and danced while we were shaking. Everybody was working up a sweat quite quickly. Ní gá ansin ach an bhláthach a bhaint ón bpróca (agus mhol mé dóibh é a bhlaiseadh) agus is é an t-im amháin atá fágtha. All that’s left to do then is to remove the buttermilk (and I encouraged them to taste it in the process) so that only the butter remains. Chuireamar ar an t-arán é agus bhlasamar é. Bhí siad ar fad sásta go raibh sé fiú níos deise ná an t-im a bhíonn ceannaithe againn. We then spread some on our bread to taste it. The children were all chuffed and convinced that it was nicer than the butter that we buy. Ní seo ach píosa an-ghearr faoin obair a rinne muid ar an gcéad lá scoile 2017 – ag tabhairt faoi aidhmneanna na bliana nua. Labhair muid ar dtús faoin mbealach gur ceart go mbeadh aidhmeanna cliste agus gur cheart ‘Táim chun níos mó léitheoireachta a dhéanamh’ a athrú go ‘Táim chun caibidil amháin a léamh gach oíche’ nó ‘Táim chun dhá leabhair a léamh in aghaidh na míosa’. This is just a really short piece to share the work we did on the first school day of 2017 – discussing New Year’s Resolutions. We first spoke about how goals should be SMART and how ‘I’m going to read more’ would be better as ‘I’m going to read a chapter every night’ or ‘I’m going to read two books per month’. Ansin, chun ár naidhmeanna a chur in iúl, d’úsáid mé smaoineamh a chonaic mé ar Irish Primary Teacher – cé go raibh sé in úsáid ansin do cheacht staire. Rinne na páistí amach leathanach bán mar atá le feiceáil thíos. Then, to display our resolutions, I used an idea that I first saw on Irish Primary Teacher – though it was used for a history lesson there. The children made out the pages as seen below. Scríobh siad a gcuid aidhmeanna ar bhun ansin agus chruthaigh siad pictiúir 3T le dul leis. Bhí siad an-deas sa deireadh, nach raibh? They wrote their resolutions at the bottom and created 3D pictures to go with them. They turned out really nicely in the end, didn’t they?